The days of executives sitting behind closed doors is over. Today, CEOs and physicians are taking Twitter followers behind the scenes and sharing real-life, real-time news and information. As this recent article in MD Magazine explains, physicians like Dr. Jennifer Gunter (@DrJenGunter) and Dr. Mike Sevilla (@DrMikeSevilla) use social media to help combat misinformation; “Wheezy Nurse” used her account (@WheezyNurse) to vent and share advice about the licensure examination for becoming a registered nurse; and some health care providers find clinical benefits to amplifying critical needs and issues facing their practice. But maintaining a social media account takes time. And time is one thing a busy executive or physician can rarely spare for inefficient purposes, so the return must justify the investment. Here are three very real reasons social media is worth your time. In 2014, Advanced Search Ranking released a study on organic (non-paid) click-through rates of search engine results. On average, 71.33% of searches resulted in a click-through on page one of organic Google search results, the first five results account for 67.6% of all clicks. An effective way to own the search results for your name or practice is by using social media. 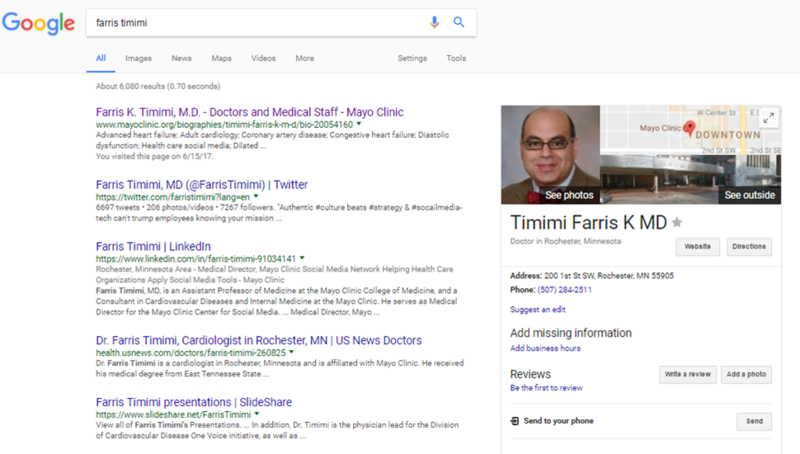 Below is an example of Google search results for Dr. Farris Timimi, a cardiologist at Mayo Clinic. Claiming the second, third, fourth, and fifth search result is Twitter, LinkedIn, Doximity-powered U.S. News & World Report listing, and LinkedIn SlideShare, respectively. This leads us to the second reason to use social media. Savvy patients will "meet" you, before they meet you. They will Google your name and, as we learned above, will likely click on one or all of the top five search results. You want to claim the best location in search engine real estate with the information you control, like your LinkedIn profile, rather than online doctor rating sites that might not be accurate or help you hone your first impression. It is acceptable (and encouraged!) to dedicate select accounts for professional use (i.e. Twitter and LinkedIn) and other accounts for personal use (i.e. Facebook, Instagram, and Pinterest). 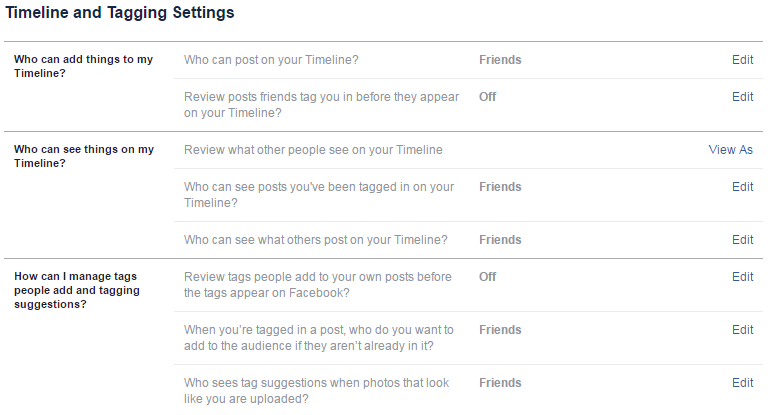 With content you prefer to keep private, ensure your privacy settings on that platform restrict viewers, see the Facebook privacy settings example below. Are you often published, well-connected, highly recommended in a specific field or a proud champion of a cause? 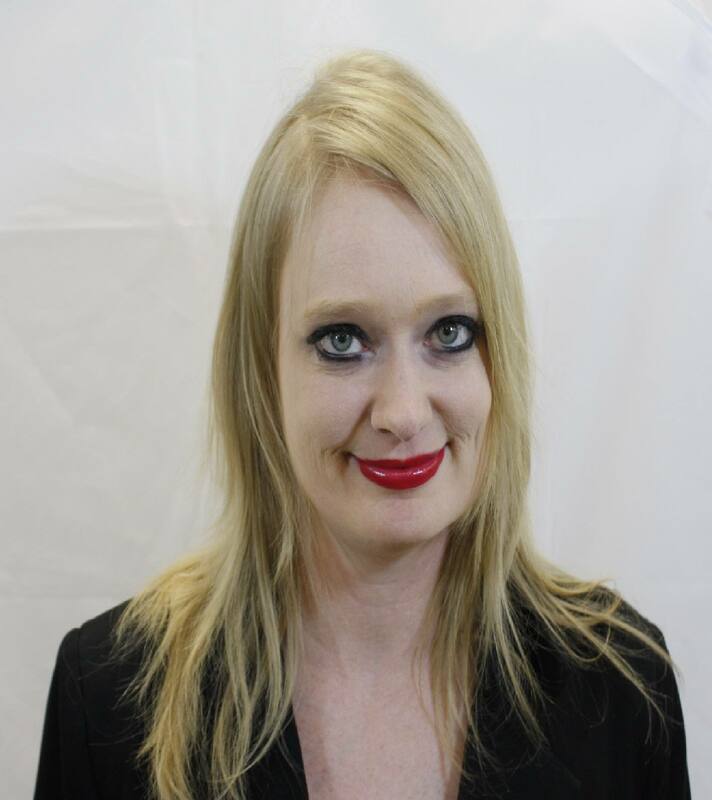 Social media allows you to feature those key assets prominently to build your personal brand. Mayo Clinic recently shared a Facebook post by Dr. Elvis Francois, an orthopedic surgery resident at Mayo Clinic, that garnered more than 2.2 million views. 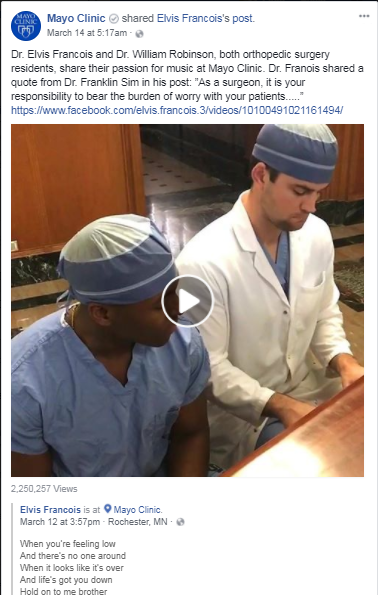 According to Dr. Francois's Facebook page, he combines his two passions–singing and medicine–to serve his patients, earning the endearing reputation as the "Singing Doctor." The days of executives sitting behind closed doors is over. I believe the key to efficient and effective social media use for physicians is for them to first deeply identify their " why"? Is it to help their patients around a specific medical issue? Is it to drive more revenue? Is it to build their own digital platform for a book they want to write one day? 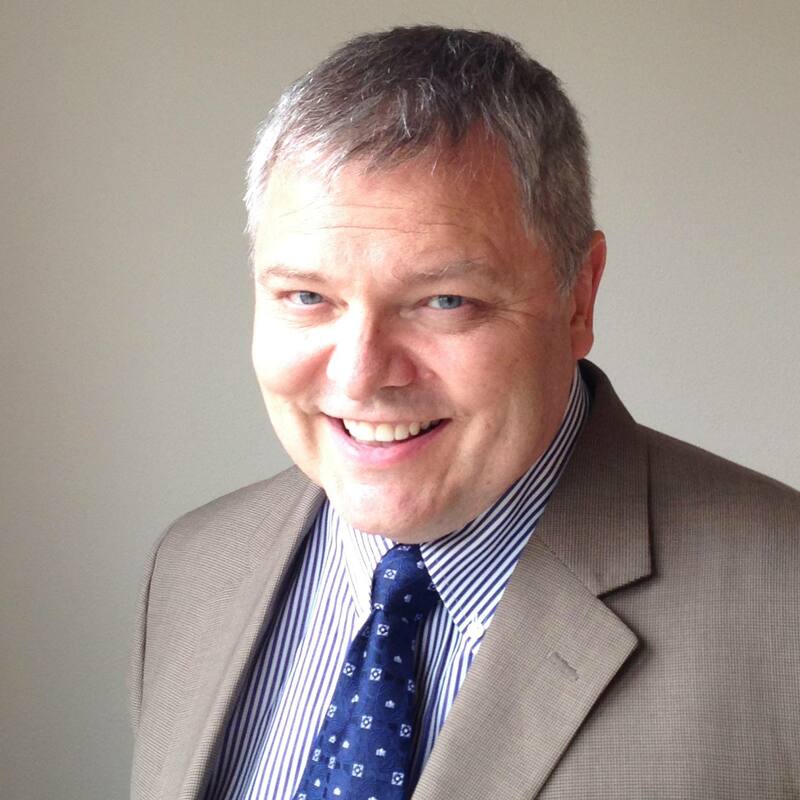 Is it to be a physician-citizen advocate for policy changes?…. With a clearly identified why, such things as content selection and time investment become easy tactical issues; without a why, then mostly it's a waste of time ( the exception to this is the inherent value of play and creativity to help one find their "why"). ( of note, the "why" I am referring to isn't usually a resume "why", or a mission statement "why", it's the 2 -in-the-morning, too audacious/afraid/embarrassed to tell anyone "why". What measurements does Google use to rank these social media sites? Is it audience size? Engagement? Mentions? The number of people visiting the page? Knowing this could better guide an ads campaign strategy.